How Will the Paris Attacks Affect Markets? U.S. Treasuries and other so-called “safe haven” investments may see interest as investors seek shelter from uncertainty. 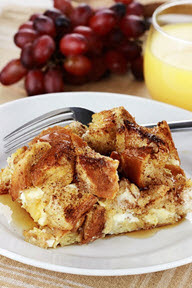 RECIPE OF THE WEEK: Easy Baked French Toast Make this classic brunch treat for a group. Ingredients: Serves 8 8 large eggs 2 cups half-and-half 1 cup whole milk 2/3 cup maple syrup or honey, plus more for serving 1 teaspoon vanilla extract 1/2 teaspoon ground cinnamon Kosher salt 1/2 cup pecans, roughly chopped 1 1/2 pounds sourdough, challah, or any hearty white bread, cut into thick slices Butter, margarine, or baking spray for the dish 2 tablespoons sugar Chef’s Tip: Add any of these optional mix-ins to increase the wow factor: 1/2 cup of chocolate chips 1/2 cup of raisins or dried cranberries 1 tablespoon of grated orange zest 1 tablespoon of cognac or bourbon Directions: Preheat your oven to 350°F. Beat the eggs with the milk, half-and-half, vanilla extract, syrup, cinnamon, and a pinch of salt. Stir in the pecans and any other optional mix-ins. Grease a baking dish and layer the bread slices in an overlapping pattern. Pour the custard liquid on top and allow the bread to soak for 20-30 minutes or overnight. Sprinkle the top with sugar and bake for 35-45 minutes until a toothpick comes out clean. If the top browns too quickly, cover with aluminum foil until the last 5 minutes of baking. Serve warm, passing additional syrup at the table. Recipe adapted from Chris Morocco | RealSimple.com TAX TIP: Don’t Forget to Report Foreign Income U.S. citizens or permanent residents who live abroad or receive income from any foreign sources must report it on their taxes. According to the IRS: Any income from foreign employment, rental income, trusts, and bank & security accounts must be reported. If you live abroad and can’t make the April filing deadline, you may qualify for an automatic two-month filing extension. Review the Foreign Earned Income Exclusion, which may qualify you to exclude up to $100,800 of earned income in 2015. Don’t overlook any credits or deductions. You may be able to deduct any foreign taxes paid on your income earned abroad. For more information, speak to your tax advisor or see IRS Publication 54, “Tax Guide for U.S. Citizens and Resident Aliens Abroad”. Tip courtesy of IRS.gov  HEALTHY LIVING: Get Headaches? Try These Remedies If you get regular headaches and don’t want to reach for common painkillers, try these remedies at home: Cut down on your salt intake. One study found that participants who switched to low-salt diets experienced fewer headaches. Try yoga and meditation. Though it may sound weird, a study found that migraine sufferers had fewer headaches after trying a mindfulness-based stress reduction program for eight weeks. Lift weights. Strength training can help you correct the muscle imbalances occurring from poor posture and help reduce tension headaches. Tip courtesy of Nissa Simon | AARP GREEN LIVING: Green Your Next Party Parties can be a ton of fun, but they can also come with a hefty environmental price tag. Reduce the impact of your next celebration with these tips: Avoid plastic or Styrofoam dishware and decorations. Try to find recyclable alternatives instead. Reduce and reuse by renting dishware, tablecloths, and other supplies instead of buying disposables. Offer transportation options to reduce the number of cars (it will make your neighbors happier!). Use locally-sourced flowers and decorations. Serve seasonal fare that’s grown locally. Tip courtesy of The Nature Conservancy Disclaimers: All index returns exclude reinvested dividends, and the 5-year and 10-year returns are annualized. Sources: Yahoo! Finance and Treasury.gov. International performance is represented by the MSCI EAFE Index. Corporate bond performance is represented by the DJCBP. Past performance is no guarantee of future results. Indices are unmanaged and cannot be invested into directly. Investing involves risk including the potential loss of principal. No investment strategy can guarantee a profit or protect against loss in periods of declining values. Diversification does not guarantee profit nor is it guaranteed to protect assets. The Standard & Poor’s 500 (S&P 500) is an unmanaged group of securities considered to be representative of the stock market in general. The Dow Jones Industrial Average is a price-weighted average of 30 significant stocks traded on the New York Stock Exchange and the NASDAQ. The DJIA was invented by Charles Dow back in 1896. The Nasdaq Composite is an index of the common stocks and similar securities listed on the NASDAQ stock market and is considered a broad indicator of the performance of stocks of technology companies and growth companies. The MSCI EAFE Index was created by Morgan Stanley Capital International (MSCI) that serves as a benchmark of the performance in major international equity markets as represented by 21 major MSCI indexes from Europe, Australia and Southeast Asia. The Dow Jones Corporate Bond Index is a 96-bond index designed to represent the market performance, on a total-return basis, of investment-grade bonds issued by leading U.S. companies. Bonds are equally weighted by maturity cell, industry sector, and the overall index. The S&P/Case-Shiller Home Price Indices are the leading measures of U.S. residential real estate prices, tracking changes in the value of residential real estate. The index is made up of measures of real estate prices in 20 cities and weighted to produce the index. The 10-year Treasury Note represents debt owed by the United States Treasury to the public. Since the U.S. Government is seen as a risk-free borrower, investors use the 10-year Treasury Note as a benchmark for the long-term bond market. Opinions expressed are subject to change without notice and are not intended as investment advice or to predict future performance. Past performance does not guarantee future results. You cannot invest directly in an index. Consult your financial professional before making any investment decision. Fixed income investments are subject to various risks including changes in interest rates, credit quality, inflation risk, market valuations, prepayments, corporate events, tax ramifications and other factors. These are the views of Platinum Advisor Marketing Strategies, LLC, and not necessarily those of the named representative, Broker dealer or Investment Advisor, and should not be construed as investment advice. Neither the named representative nor the named Broker dealer or Investment Advisor gives tax or legal advice. All information is believed to be from reliable sources; however, we make no representation as to its completeness or accuracy. Please consult your financial advisor for further information. By clicking on these links, you will leave our server, as they are located on another server. We have not independently verified the information available through this link. The link is provided to you as a matter of interest. Please click on the links below to leave and proceed to the selected site. Sources: 1 http://www.cnbc.com/2015/11/13/us-markets.html http://finance.yahoo.com/q/hp?s=%5EGSPC&a=10&b=9&c=2015&d=10&e=13&f=2015&g=d http://finance.yahoo.com/q/hp?s=%5EIXIC&a=10&b=9&c=2015&d=10&e=13&f=2015&g=d http://finance.yahoo.com/q/hp?s=%5EDJI&a=10&b=9&c=2015&d=10&e=13&f=2015&g=d 2 http://www.cnn.com/2015/11/14/world/paris-attacks/ 3 http://www.bbc.com/news/world-middle-east-34805466 http://www.cnn.com/2015/11/09/middleeast/russian-plane-crash-egypt-sinai/ 4 http://www.military.com/daily-news/2015/11/16/officials-no-credible-threats-target-us-after-paris-attacks.html 5 http://www.cnbc.com/2015/11/15/paris-terror-the-potential-aftermath-for-markets.html 6 http://www.foxbusiness.com/economy-policy/2015/11/13/week-ahead-fomc-october-minutes-inflation-data/ 7 http://www.foxbusiness.com/economy-policy/2015/11/13/october-retail-sales-risefall-0x/ 8 http://www.foxbusiness.com/economy-policy/2015/11/12/weekly-jobless-claims-rosefell-by-x000/ 9 http://www.cnbc.com/2015/11/13/september-business-inventories-rise.html 10 http://www.foxbusiness.com/economy-policy/2015/11/13/consumer-sentiment-rebounds-after-october-tumble/ 11 http://www.realsimple.com/food-recipes/browse-all-recipes/baked-french-toast-casserole 12 http://www.irs.gov/uac/Newsroom/Tips-for-US-Taxpayers-with-Foreign-Income https://www.irs.gov/Individuals/International-Taxpayers/Foreign-Earned-Income-Exclusion 13 https://www.youtube.com/watch?list=UUPLAYER_GolfTipsMag&v=a56FnKrpg1M 14 http://www.aarp.org/health/conditions-treatments/info-2015/headache-relief.html?intcmp=-FLXSLDR-SLIDE1-RL1 15 http://www.nature.org/ourinitiatives/regions/northamerica/unitedstates/mississippi/green-party-ideas-1.xmlInvesting involves risk including the potential loss of principal. No investment strategy can guarantee a profit or protect against loss in periods of declining values.